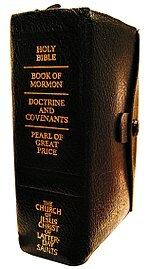 The Book of Mormon, subtitled since 1981 "Another Testament of Jesus Christ"
The standard works are printed and distributed by the LDS Church both in a single binding called a quadruple combination and as a set of two books, with the Bible in one binding, and the other three books in a second binding called a triple combination. Current editions of the standard works include a number of non-canonical study aids, including a Bible dictionary, photographs, maps and gazetteer, topical guide, index, footnotes, cross references, and excerpts from the Joseph Smith Translation of the Bible (JST). Under the LDS Church's doctrine of continuing revelation, Latter-day Saints believe in the principle of revelation from God to his children. Individual members are entitled to divine revelation for confirmation of truths, gaining knowledge or wisdom, meeting personal challenges, and so forth. Parents are entitled to revelation for raising their families. Divine revelation for the direction of the entire church comes from God to the President of the Church, who is considered to be a prophet by Latter-day Saints in the same sense as Noah, Abraham, Moses, Peter, and other biblical leaders. When prophets and general authorities of the church speak as "moved upon by the Holy Ghost", it "shall be scripture, shall be the will of the Lord, shall be the mind of the Lord, shall be the word of the Lord, shall be the voice of the Lord, and the power of God unto salvation." Members are encouraged to ponder these revelations and pray to determine for themselves the truthfulness of doctrine. April 6, 1830: When the church was organized it is presumed that the Bible and Book of Mormon were unanimously accepted as scripture. August 17, 1835: Select revelations from Joseph Smith were unanimously accepted as scripture. These were later printed in the Doctrine and Covenants. October 10, 1880: The Pearl of Great Price was unanimously accepted as scripture. Also at that time, other revelations in the Doctrine and Covenants – which had not been accepted as scripture in 1835 because they were received after that date – were unanimously accepted as scripture. October 6, 1890: Official Declaration 1 was accepted unanimously as scripture. It later began to be published in the Doctrine and Covenants. September 30, 1978: Official Declaration 2 was accepted unanimously as scripture. It immediately was added to the Doctrine and Covenants. It is not to be thought that every word spoken by the General Authorities is inspired, or that they are moved upon by the Holy Ghost in everything they speak and write. Now you keep that in mind. I don't care what his position is, if he writes something or speaks something that goes beyond anything that you can find in the standard works, unless that one be the prophet, seer, and revelator—please note that one exception—you may immediately say, "Well, that is his own idea!" And if he says something that contradicts what is found in the standard works (I think that is why we call them "standard"—it is the standard measure of all that men teach), you may know by that same token that it is false; regardless of the position of the man who says it. Quadruple combination opened to the Book of Isaiah (note the cross references between Biblical and Latter-day Saint scripture in the footnotes). English-speaking Latter-day Saints typically study the LDS Church-published edition of the King James Version of the Bible (KJV), which includes LDS-oriented chapter headings, footnotes referencing books in the Standard Works, and select passages from the Joseph Smith Translation of the Bible. Though the KJV was always commonly used, it was officially adopted in the 1950s when J. Reuben Clark, of the church's First Presidency, argued extensively that newer translations, such as Revised Standard Version of 1952, were of lower quality and less compatible with LDS tradition. After publishing its own KJV edition in 1979, the First Presidency announced in 1992 that the KJV was the church's official English Bible, stating "[w]hile other Bible versions may be easier to read than the King James Version, in doctrinal matters latter-day revelation supports the King James Version in preference to other English translations." In 2010 this was written into the church's Handbook, which directs official church policy and programs. A Spanish version, with a similar format and using a slightly revised version of the 1909 Reina-Valera translation, was published in 2009. Latter-day Saints in other non-English speaking areas may use other versions of the Bible. Though the Bible is part of the LDS canon and members believe it to be the word of God, they believe that omissions and mistranslations are present in even the earliest known manuscripts. They claim that the errors in the Bible have led to incorrect interpretations of certain passages. Thus, as church founder Joseph Smith explained, the church believes the Bible to be the word of God "as far as it is translated correctly." The church teaches that "[t]he most reliable way to measure the accuracy of any biblical passage is not by comparing different texts, but by comparison with the Book of Mormon and modern-day revelations". The manuscripts of the Joseph Smith Translation of the Bible state that "the Song of Solomon is not inspired scripture," and therefore it is not included in LDS canon and rarely studied by members of the LDS Church. However, it is still printed in every version of the King James Bible published by the church. Although the Apocrypha was part of the 1611 edition of the KJV, the LDS Church does not currently use the Apocrypha as part of its canon. Joseph Smith taught that while the contemporary edition of the Apocrypha was not to be relied on for doctrine, it was potentially useful when read with a spirit of discernment. Joseph Smith translated selected verses of the Bible, working by subject. Smith did not complete the entire text of the Bible during his lifetime. However, his incomplete work is known as the Joseph Smith Translation of the Bible, or the Inspired Version. Although this selected translation is not generally quoted by church members, the English Bible issued by the church and commonly used by Latter-day Saints contains cross references to the Joseph Smith Translation (JST), as well as an appendix containing major excerpts from it. However, with the exceptions of Smith's translation of portions of the Book of Genesis (renamed Selections from the Book of Moses) and the translation of Matthew (called Joseph Smith–Matthew), no portions of the JST have been officially canonized by the LDS Church. Latter-day Saints consider The Book of Mormon a volume of holy scripture comparable to the Bible. It contains a record of God's dealings with the prophets and ancient inhabitants of the Americas. The introduction to the book asserts that it "contains, as does the Bible, the fullness of the everlasting gospel. The book was written by many ancient prophets by the spirit of prophecy and revelation. Their words, written on gold plates, were quoted and abridged by a prophet-historian named Mormon." Segments of the Book of Mormon provide an account of the culture, religious teachings and civilizations of groups who immigrated to the New World. One came from Jerusalem in 600 B.C., and afterward separated into two nations, identified in the book as the Nephites and the Lamanites. Some years after their arrival, the Nephites met with a similar group, the Mulekites who left the Middle East during the same period. An older group arrived in America much earlier, when the Lord confounded the tongues at the Tower of Babel. This group is known as the Jaredites and their story is condensed in the Book of Ether. The crowning event recorded in the Book of Mormon is the personal ministry of Jesus Christ among Nephites soon after his resurrection. This account presents the doctrines of the gospel, outlines the plan of salvation, and offers men peace in this life and eternal salvation in the life to come. The latter segments of the Book of Mormon details the destruction of these civilizations, as all were destroyed except the Lamanites. The book asserts that the Lamanites are among the ancestors of the indigenous peoples of the Americas. According to his record, Joseph Smith translated the Book of Mormon by gift and power of God through the Urim and Thummim. Eleven witnesses signed testimonies of its authenticity, which are now included in the preface to the Book of Mormon. The Three Witnesses testified to having seen an angel present the gold plates, and to having heard God bear witness to its truth. Eight others stated that Joseph Smith showed them the plates and that they handled and examined them. The LDS Church's Doctrine and Covenants is a collection of revelations, policies, letters, and statements given to the modern church by past church presidents. This record contains points of church doctrine and direction on church government. The book has existed in numerous forms, with varying content, throughout the history of the church and has also been published in differing formats by the various Latter Day Saint denominations. When the church chooses to canonize new material, it is typically added to the Doctrine and Covenants; the most recent changes were made in 1981. The Pearl of Great Price is a selection of material produced by Joseph Smith and deals with many significant aspects of the faith and doctrine of the church. Many of these materials were initially published in church periodicals in the early days of the church. Selections from the Book of Moses: portions of the Book of Genesis from the Joseph Smith Translation of the Bible. The Book of Abraham: a translation from papyri acquired by Smith in 1835, dealing with Abraham's journeys in Egypt. The work contains many distinctive Mormon doctrines such as exaltation. Joseph Smith—Matthew: portions of the Gospel of Matthew from the Joseph Smith Translation of the Bible. Joseph Smith—History: a first-person narrative of Smith's life before the founding of the church. The material is taken from Documentary History of the Church and is based on a history written by Smith in 1838. The Articles of Faith: concise listing of thirteen fundamental doctrines of Mormonism composed by Smith in 1842. The church's intent is to further integrate the teachings found in the Standard Works with that of church leaders and other current sources. ^ "LDS Church releases Spanish-language Bible" Archived 2009-12-04 at the Wayback Machine, Salt Lake Tribune, 17 September 2009. ^ "LDS Edition of The Holy Bible in Spanish". lds.org. Archived from the original on 25 October 2012. Retrieved 6 February 2014. ^ Scott Taylor, "LDS Church publishes new Spanish-language Bible", Deseret News, 13 September 2009. ^ "LDS Edition of Bible in Portuguese", Liahona, November 2015. ^ Michael Morris, "President Eyring Announces 'Great Blessing' for Portuguese-Speaking Saints", lds.org, 15 September 2015. ^ See the Ninth Article of Faith. ^ Harold B. Lee, The First Area General Conference for Germany, Austria, Holland, Italy, Switzerland, France, Belgium, and Spain of The Church of Jesus Christ of Latter-day Saints, held in Munich Germany, August 24–26, 1973, with Reports and Discourses, 69. OCLC 59671066. ^ Joseph Smith, B. H. Roberts (ed.) (1902). History of the Church, 2:243–246. ^ "Scriptural Text for Visions Added to Pearl of Great Price". Ensign. May 1976. ^ Harold B. Lee, "The Place of the Living Prophet, Seer, and Revelator," Address to Seminary and Institute of Religion Faculty, Brigham Young University, 8 July 1964. ^ a b Stack, Peggy Fletcher (February 18, 2011). "LDS sticking with King James Version". The Salt Lake Tribune. Retrieved 2010-02-21. Quadruple Combination: Official Edition of the LDS Standard Works (LDS Edition of the King James Bible, the Book of Mormon, Doctrine and Covenants, and Pearl of Great Price) in PDF format, including footnotes, chapter headings and supplemental material.